3 beautiful ac offers privacy without isolation! You'll appreciate the unique design this home has to offer. Entry foyer opens to sunken LR w/wood burning FP. Formal DR w/wd flooring accent opens to spacious 4 season rm w/skylights, 2nd fireplace & wall of windows overlooking private fenced  backyd ideal space for pets. Master suite has walk-in closet & 3/4 BA w/laundry closet. 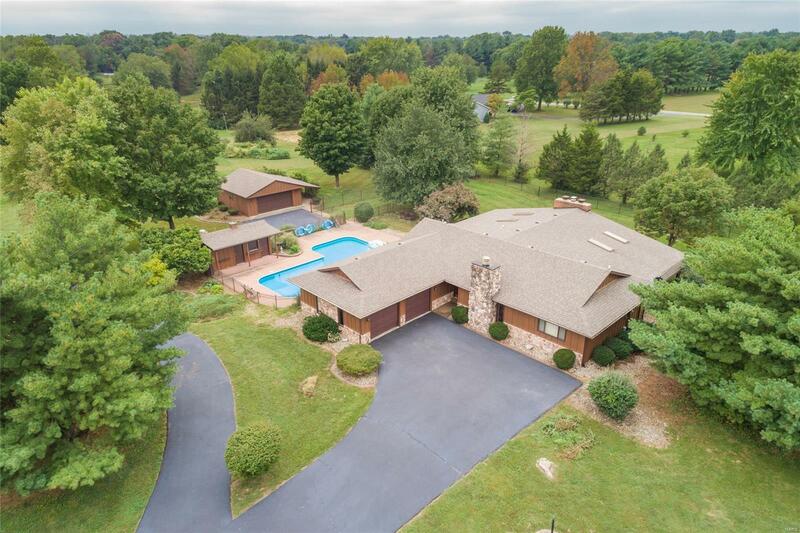 Entertaining LL is ideal for family functions, FR [carpet Sep 2018] full BA, & recreation area w/bar. French doors from FR lead to atrium w/3rd fireplace & endless outdoor views. Bring the entertaining outdoors & enjoy the salt water pool [chlorine generator 2018] & BA house complete w/kitchenette &1/2 bath. Zoned HVAC [unit & air handler replaced 2018] Additional garage will accommodate lawn equipment & outdoor toys. Battery backup sump pimp replaced Dec, 2018. Just 25 min to downtown St Louis & approx 19 mi to Scott AFB. City Inspection completed Oct 2018.